A foot bridge crosses the Elbow River shortly after it flows west out of the Glenmore Reservoir. Like many bridges, it is a good place to stop and check out the views. 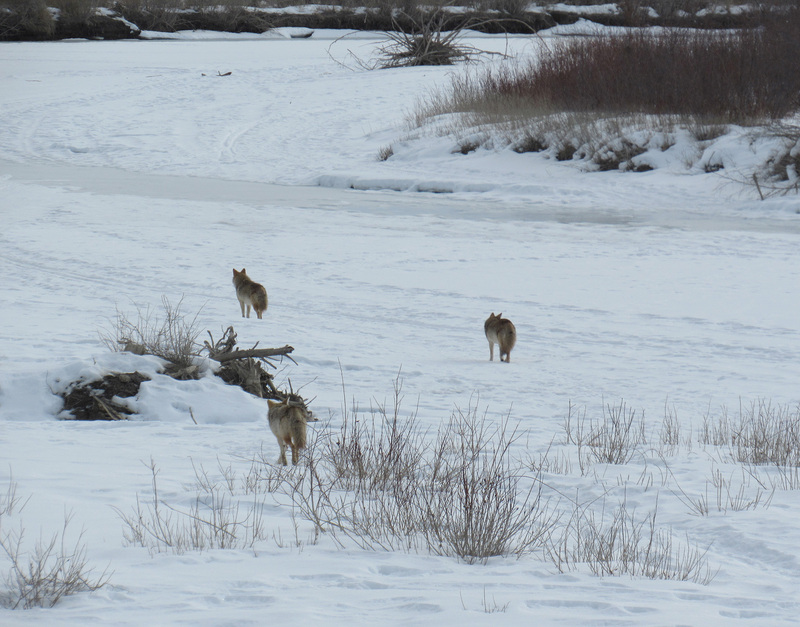 I looked east toward the reservoir and saw three coyotes walking on the frozen river. For a few seconds, there was just me, the frozen landscape and the coyotes. I don’t know how to describe that beauty. That would have been such a thrilling moment. Thanks for sharing, Myriam! I’ve been wanting to draw them and thanks for the inspiration!! Oh, I’m so glad you felt some of the thrill :-)! I hope you draw a coyote. They have such an interesting face and eyes… and you’re really good at those. And you can draw awesome fur too! Thanks, Myriam. Strangely, I did try to draw one of your coyotes about the time you were posting this message last night. I wasn’t thrilled with it, but I want to try again because they are such beautiful subjects. Thanks for your gorgeous photos. What a thrilling thing you experienced there! Oh yay, I’m so flattered that you drew a coyote from one of my photos!!! Sorry it didn’t work out on your first try. The cat portrait you posted today is beautiful :-). Aww thanks Myriam. I never know what will turn out. I’m as surprised as anyone else lol. Yeah I’m still thinking about those coyotes!!! Wow, what a moment that was, and you captured it so well I feel like I’m right there too. Were you using a telephoto lens? Oh thanks Melissa :-)! I’m so glad the pictures drew you in. I have a Canon Powershot with a 50 time zoom lens. It isn’t very heavy to carry and I like that it gives me a vision superpower. Just to clarify – my camera is a Canon Powershot SX530 HS. Do you photograph animals on your hikes? Oh, ok. Thank you. I have been trying to get more birds into my paintings and I’m not good at sketching on the wing so I’ve been wanting to get a better camera. I understand there are beautiful white pelicans that visit us in this area right about now, and I long to see them. I hope that a camera with a good lens might serve in place of binoculars as well but I may be asking too much! I hope you find a good viewing tool for the pelicans and I really, really hope you get to see them! They fly through? There are some in Calgary in the summer but I have yet to see them. Well, I did see a couple fly over my head once. They were way up high… and white… and definitely not gulls. A birder told me a place he’d seen them hang out but they weren’t there the day I went. :-D! I do hope you have more luck finding a pelican than a unicorn! And I am very much looking forward to seeing the photos. I’m sure you’ll have a wonderful time out there looking at and listening to the ice breaking. I love watching the river ice here. What a beautiful trio! I totally understand how you felt in those moments! Thanks Deborah :-). I’m so glad you get the feeling! Breathtaking! What a magical moment you had, thank you so much for sharing the beauty of it. Thanks Haunani :-)! I’m so glad you felt the magic. They are such beautiful animals. Their winter fur!!! Ahh :-D! It sounds like you’ve had some pretty sweet moments too! But each moment does have its very own special feel. 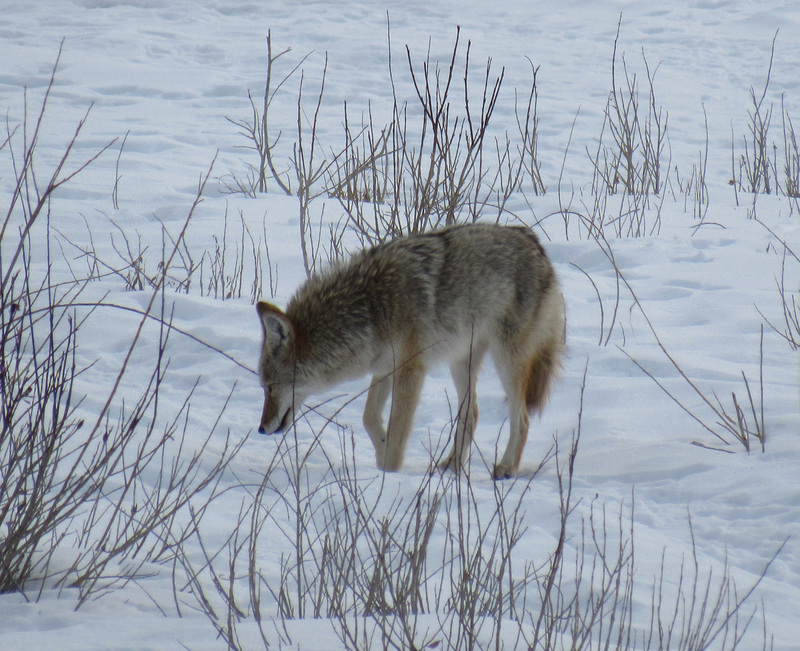 Oh, Myriam, your photos captured the kind of special feelings we have for coyotes! Sometimes they howl loudly at night and wake me up but theirs is the only sound that I don’t mind being awakened by. We love them and they have never bothered our chickens. We know people who want to shot them and we just can’t understand it (these are people who don’t even have livestock). Neat that you hear them howl at night :-). 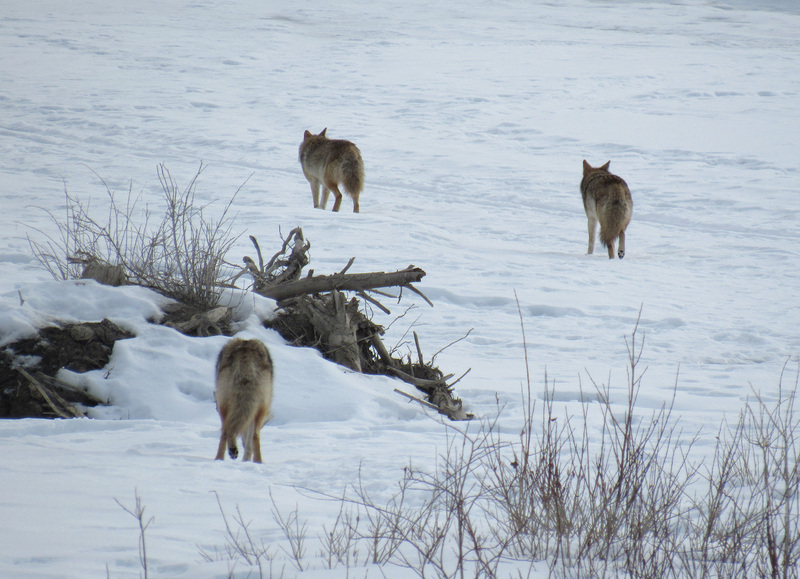 I’m glad my photos captured some special coyoteness. I find the photos quite touching… but they remind me of how I felt when I saw them… so I wasn’t sure how other people would see the photos. I like that they have a space to live near the city but of course that means that they sometimes wander into the city and people get upset… I guess not everyone wants to share their space with coyotes. Are your chickens coyote-proof or do the coyotes in your area have enough wild food to not bother with chickens? Do you have livestock besides chickens? We tried to make our chicken hut predator safe with mainly raccoons and possums in mind. I’ve never heard of any chicken owners in town having trouble with coyotes. The major predators are dogs (neighbors and feral), hawks, raccoons, and possums. And, yet, there are folks around who have this irrational hatred of coyotes. It’s frustrating. 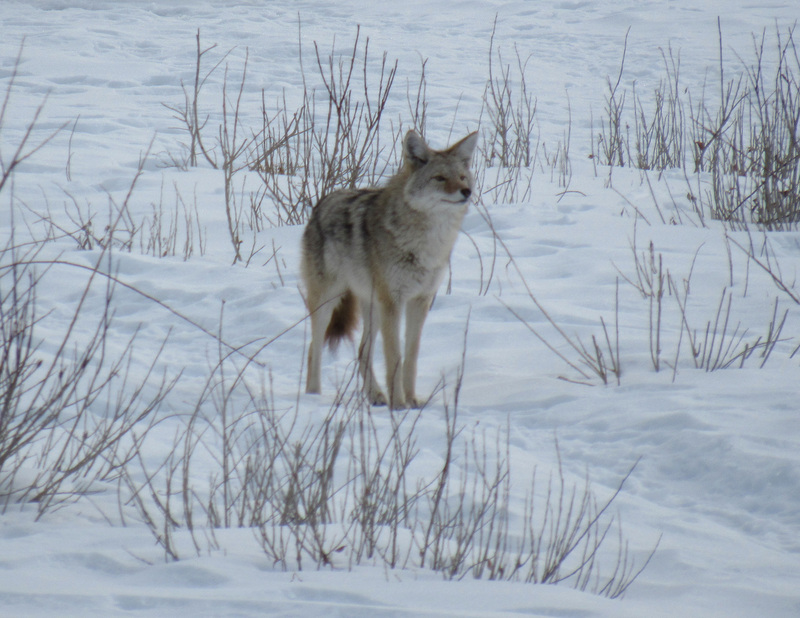 I think coyotes around here help keep the population of deer, rabbit and other smaller animals in check which is a great thing since those those tend to destroy people’s gardens. We used to have geese, too, but they were more trouble to maintain since they needed constant fresh water and we don’t have a stream or pond on our property. Hmm… maybe coyotes prefer furries to featheries. Silly to hate all coyotes! Moderate numbers keep the furry herbivores down to plant friendly levels. 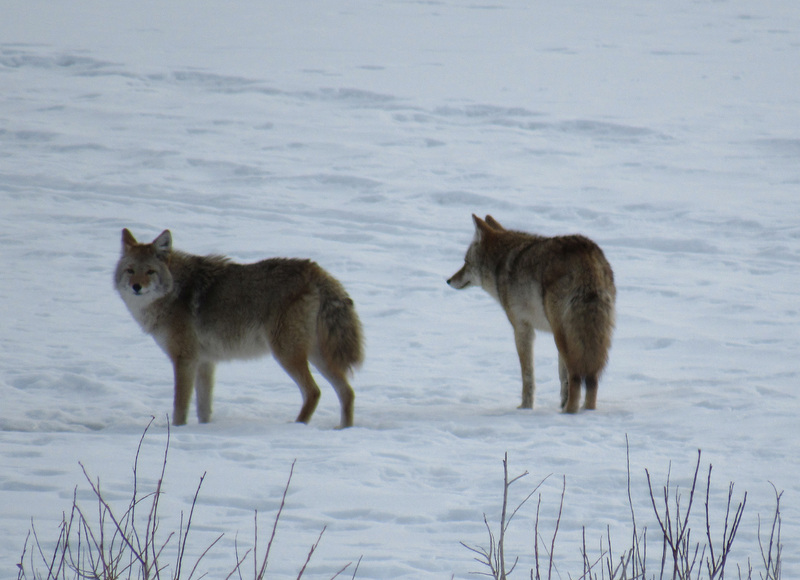 Interesting to learn that coyotes aren’t a chicken issue but feral dogs are. And I just learned that some native reserves in Alberta have feral dog issues and that there are contraceptive implants for animals. So much I don’t know!!! It is very sad that some people abandon their pets :-((((.The contraceptive implants are only effective for about a year but they are less expensive and less invasive than surgery. People know what they’ve been taught or they jump to a conclusion based on very few facts or they make an emotional decision or… Hmm, I can’t say I’m immune :-D! But hopefully knowledge and kindness will prevail. At least, it sometimes has some impact. 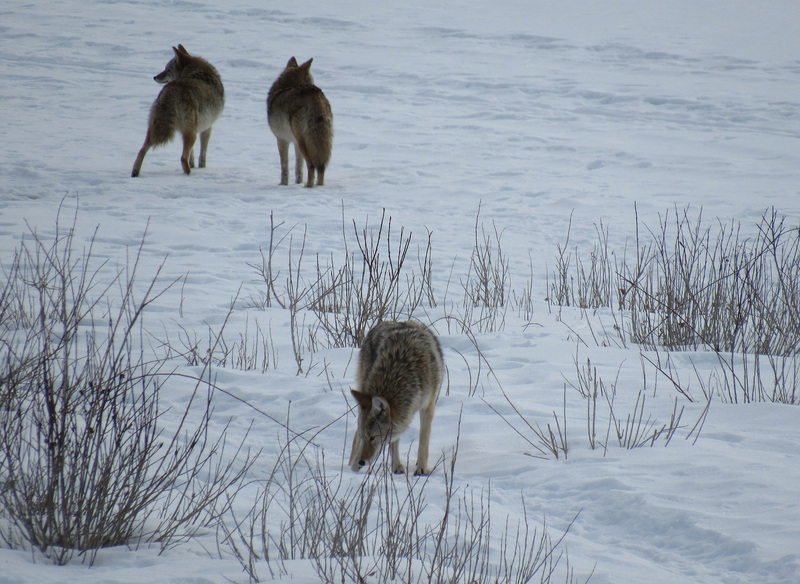 You did a terrific job of describing, through your words and these rich photos, the magic of meeting the three coyotes that day, Myriam. Thanks for bringing us along. Thanks Jet :-). I’m glad you felt the magic! This is really amazing. Thank you for sharing. I have seen them only at the distance and would like to see them closer. We have them wandering in the city now. I guess their habitat loss has forced them to look for anything for their survival even in urban areas. I’m so glad you enjoyed the photos :-). I was lucky to be on the foot bridge at the right time. A lot of animals choose to look for food in cities because there is food available and they can adapt to living in cities or on the outskirts. I suppose that if they had a more awesome environment available to live and find food in, they would choose that place instead. But I think there would still be a few adventurous ones who would want to check out the city… unless they knew it to be a very dangerous place. I like urban wildlife… I’m glad a few animals can make an urban living so that I can get excited about a jackrabbit or a skunk or a coyote. I keep playing wildlife photographer roulette :-). Sometimes I win squirrels and black-capped chickadees. Sometimes I get little surprises! Oh, squeeeeee! I’m so excited for you! I haven’t seen either but I think both are occasionally sighted in Calgary. Where did you see them? And what is the story behind lil miss poutine? I like the new look of your blog! Maybe you changed it a little while ago but I just noticed. Yesterday being Family Day in BC, naturally I went birding. 🙂 I found the American Kestrels driving through Surrey on Colebrook Road, and the Northern Pygmy Owl at Deboville Slough in Coquitlam. I’ll cover both in future posts. lilmisspoutine was an alias I used when I first started blogging about 4 years ago (I do like poutine! ), so that’s how lilmisspoutinessegues.wordpress.com got started. but, when my blog started heading in the direction of a photo blog, I decided to rebrand as whsimphotos.wordpress.com in June 2015. Naturally :-D! Very much looking forward to seeing your photos!!! I’ve never been to a slough but I’ve heard they can be good places to see birds. I’ll try to check out one of the sloughs around here once the snow and ice melt. Thanks for a little bit of your blogging history. I’m glad you moved in the direction of taking high quality bird photos of the Vancouver area. Though I’m from Quebec, I’ve never had poutine. I’m not a big fan of gravy but I do like fries and cheese curds!